About the Hardwoods for our Lever Harps — Rees Harps Inc.
Information about the hardwoods used for Rees lever harps. Lever harps are often also called Irish harps or Celtic harps. We are also the makers of Harpsicle® Harps. Rees has been building harps since 1972. Our harps are hand crafted in Rising Sun, Indiana, United States. Before going further it is important to clear-up a common misconception. Among many stringed instrument musicians (acoustic guitarists in particular) there is an almost cult-like belief that the wood chosen for an instrument accounts for the majority of the voice of the instrument. Everywhere these musicians talk with one another you will hear things like, “Walnut has such a bright voice,” or, “spruce sounds very clean,” or “cherry is so warm.” Let’s be extremely clear - yes, wood matters but in the overall scheme of things it is design and quality of craft matter much, much more. Which lutherie builds your harp absolutely dwarfs all other considerations. Along those same lines, when you hear someone say, “cherry sounds so warm,” you need to remember that every single tree of every single species is unique. Any given piece of cherry lumber will have a variation in the cellular structure (which is what creates voice) not only based upon different trees but based upon different parts of the same tree. The easiest way to understand this is by imagining a tree which is growing on a steep mountain. The cellular structure on the uphill side of the tree will be quite different than that of the downhill side because the tree is working to grow straight up. So yes, wood matters but it is wise to keep it in perspective. “I love wood.” We hear that all the time as people gently stroke the top of the arch of a harp. Hardwoods are like that. The small, dense cells allow them a slick, solid feel; a solid sense of comfort. The visual beauty of the wood grain with depths of hidden highlight is truly high art. In lever harps hardwoods comprise all but the soundboard itself and the primary job of these woods is to provide mechanical strength and structure. 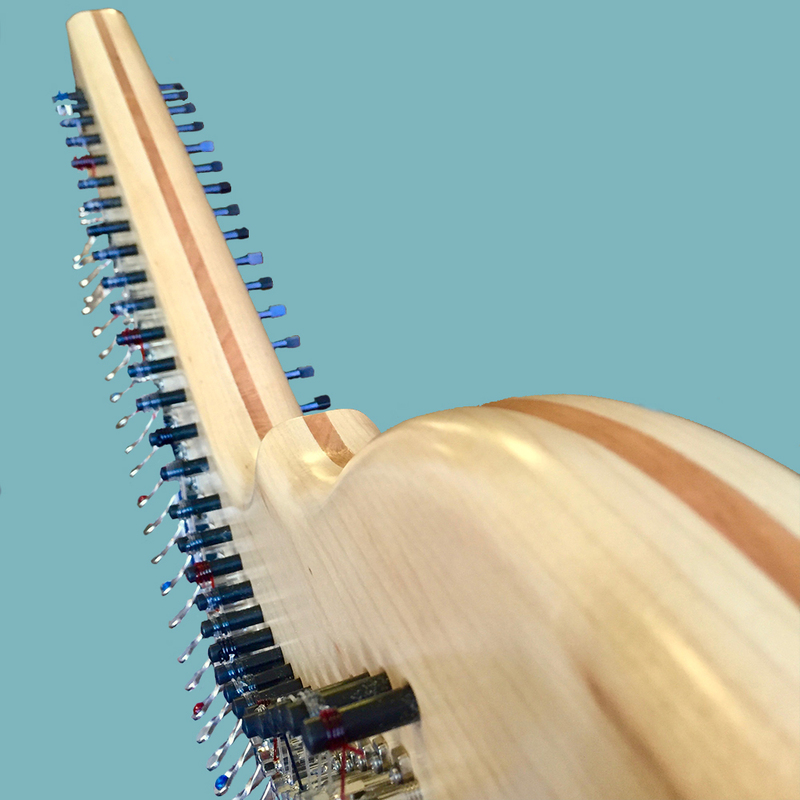 Additionally, if the back of a harp is properly designed it will work in concert with the soundboard to amplify and augment the frequency pushed off the inner back of the soundboard. Nearly every time we are taking an order for a custom harp our customer will ask us which hardwood sounds better. Here’s a big secret…it is almost entirely a matter of personal opinion. Honestly, any quality lutherie hardwood can be worked into a wonderful instrument so choose the one you like the best. At Rees, because of our design, there is actually less variation within a given model than there is for most other lutheries. For instance, one Aberdeen Meadows Concert Line Harp sounds almost indiscernibly like another* unless you have them right next to each other. (The one caveat being that any of our brand new harps sounds brighter than it will after the strings settle and the soundboard rises. See Why Soundboards Belly-up.) We think of it as our job to give you that “Aberdeen” sound so we invite you to feel free to select the wood or combination of woods you think is the most striking. A maple, cherry, maple hardwood laminate Rees Harps harmonic arch. Luthiers using some early harp designs and those using the late Robbie Robinson’s double harmonic curve approach for the pin pattern in the neck, tend to advocate the use of hardwood laminated in the arch. These harps also tend to have necks with a deep dip along the arch, something like and exaggerated “S” curve. While a double harmonic curve design is based upon some interesting acoustic science, the mechanical integrity of an “S” curve, in the applicable axis, is terribly low. For this reason luthiers using this design often laminate together several pieces of solid hardwood to add the strength of cross grain to the arch. Coming from another design approach, lutheries like Rees and Dusty Strings use a straighter, less exaggerated arch and an in-line string layout. The mechanical integrity of this type of arch is inherently less compromised so lamination is not necessary…with one exception. In our case we add that extra hardwood lamination in for our large double harps…just to be safe.